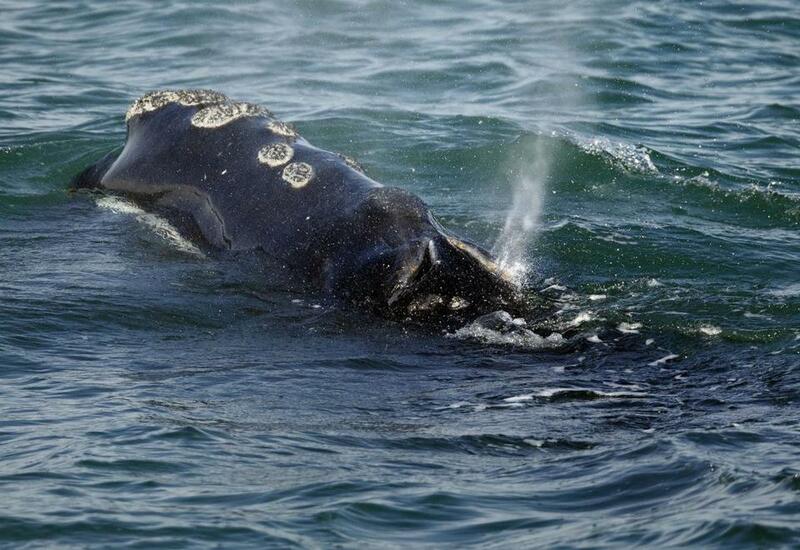 A North Atlantic right whale was seen off Plymouth last March. The federal government has asked mariners to slow down in, or avoid altogether, a protected area off Nantucket set up to keep endangered right whales safe. The National Oceanic and Atmospheric Administration recommends vessels voluntarily travel at 10 knots or less until Feb. 11 The request came after 100 North Atlantic right whales were spotted south of the island on Jan. 15. “We are also asking commercial fishermen to be vigilant when maneuvering to avoid accidental collisions with whales, remove unused gear from the ocean to help avoid entanglements, and use vertical lines with markings, weak links, and breaking strengths,” NOAA officials said in a statement. About 20 of the whales were spotted in the 2,800-mile area on Sunday , said Jennifer S. Goebel, a spokeswoman for NOAA’s Greater Atlantic Regional Fisheries Office. “They were spotted . . . by a New England Aquarium survey plane,” she said. In addition to the sightings near Nantucket, five right whales were spotted in Cape Cod Bay on Jan. 26, officials said. With an endangered population of slightly more than 400, right whales are considered to be one of the rarest marine mammals in the world, according to NOAA officials. They are protected under the Endangered Species Act and the Marine Mammal Protection Act. Danny McDonald of the Globe staff contributed to this story.